The pommel of the garberg can be used for tenderising, smashing and firesteel striker. This is much safer than using the knife with the blade exposed. Note: the sheath that comes with the garberg is able to be used in many ways. Shown is the setup that can be attached to a bag, pack frame car/house interior.. I don't know how useful this will be but you can essentially have the knife on a simple belt loop in use and then you can easily remove it and put it in its wall mount when done.. The Eldris has 2 drain holes that can be used to thread a cord for neck carry. The Garberg is considerably heftier than the companion and you can see the difference in blade thickness. Eldris - The outside of the handle is rubberised and the flats are a different texture. Its a great size and you can get good purchase ion the knife despite its small size.. The garberg and the eldris are stainless. Some people are against it. I love it as I live coastal and am sick of my knives getting surface rust. Garberg - this is considerably thicker than the other knives and feels much heavier. It can take hard use. Grind is good but I'm not that fussed on the blade profile..
Eldris - Great little blade. Grinds are a bit wonky on mine and I'm not sure that the compound grind will provide any benefit. Great little camp fire whittler..
Companion - Simple scandi grind nice profile. Garberg - Modular sheath can be used in a variety of ways. Can be simplified to a simple belt loop which I prefer.. The eldris is well priced as a similar helle offering the Nying is priced at $100 so its well priced and I doubt you'd find that design cheaper.. The garberg is priced high compared the earlier mora offerings. Too high in my opinion but it seems it would last a lifetime. The companion is the most comfortable and best priced mora in my opinion. You can get the bahco version even cheaper. You could have 4-5 companions for the same price as a garberg and if they fail so be it.. The Eldris is a great little package and a knife that imo has been missing in the market. Its the best value necker you'll find and I think it will really blow other neck knives out of the water for comfort and use.. The Garberg is a considerable step up from standard mora's. Its much heavier than a normal mora and feels much heftier.. That being said its at the lower end (excluding cheaper mora) price wise and it would be a very reliable tool. I question the modular sheath being a standard option as I think you could shave a good whack off the price by selling it with just the belt loop and have it as an option. I also thing the belt loop on the sheath is better than the fully enclosed leather sheath. Its simple... The exposed tang adds to the utility of the knife and I think its a worthwhile addition.. So these are just my ramblings. There may be things I have overlooked or don't understand correctly so if you have any corrections please let me know.. I will be putting these to use soon and will do a write up when I have..
Hope this helps anyone who was interested in these new blades.. I have a few Companions, too.....and I agree with you, the cost vs. comfort factor gives it the 'edge' (pardon me) of any of the knives in the Mora line that I've purchased. The 'Robust' is one I bought when they first hit the market. It's more 'robust' all the way around than the Companion and has a longer partial tang than the Companion, but the handle is not nearly as ergonomic in MY hand. Consequently, I have hardly used it, but the Companion, even though it looks less sturdy and has wimpier blade dimensions, seems way handier and comfortable to use. Like you, I always heard how lacking the Companion's sheath design is, but it retains the knife adequately, works great for one-handed release & stowing and clips easily to the top edge of the bib on my overalls where it serves as a neck-type knife without the hassles of a sheath knife swinging around and getting in the way when I'm trying to do something else. We seem to be an army of two. Very good initial review, thanks for sharing with us!! I'll be looking forward to your thoughts after you have had time to get them out and use them for a while! Great Utility knives, especially for cutting cardboard or carpets. I own a Garberg and a BB - which is probably similar to the Companion - and if the SHTF and I had to bug out I would probably grab the Garberg on my way out the door. It's turned out to be a better knife than I thought it might be. Thanks for the advice, I think I'll get the Garberg then. I still can't warm up to a Mora knife. There are just too many better knives out there. Price, Quality, Availability. Pick two. I'm working hard to be restrained. You didn't include aesthetics in your choices. Moras look like , IMO. LOL, ok, the ice is broken. Price, Can't argue that point, they are cheap. Quality, You have to define quality as it is very subjective, I define quality as a product made from quality materials by artisans who insure a high level of fit, finish, and serviceability, it the case of knives, a quality outdoors knife should be made of high quality tool steel, high carbon or stainless, it should either be forged or formed by metal reduction, the blade should be properly heat treated and tempered, it should be full tang, have a handle made of stabilized wood or micarta, shaped to fit the hand comfortably, the sheath should be made of good leather or of a polymer material that doesn't scratch or dull the blade, but never of common plastic. The knife should be fitted and finished by hand and inspected before being boxed for shipment, a quality knife should withstand the stresses of what ever the knife was designed to do, the edge should under normal use take a fine edge and hold it, it shouldn't chip or roll, and finally it should be pleasing to the eye, IMHO Mora knives fail to meet the requirements outlined above. All that can be said for Mora knives is that they are inexpensive, they do cut, and they do come with a sharp edge, but then again, any piece of metal can be sharpened to a fine edge and cut or slice, that alone doesn't make it a quality outdoors knife, it does however make it a cheap utility knife. Availability, that's to be expected, they a machine made and finished by the thousands at a cost of probably less than $3.00 each on average, including sheath, packaging, and shipping. That's EXACTLY what they were DESIGNED to be.....a disposable, cheap, utility knife that is meant to be used and discarded by the end user. In the Scandinavian countries, workers buy them by the dozen with that intent in mind., use 'em, use 'em hard & discard 'em.....just like we buy the box-cutter type utility knives with the disposable, reversible, replaceable, Scandi-ground blades. Think of them as a more-comfortable-to-use answer to a utility knife that is seldom, if ever re-sharpened by their Scandinavian owners. We seem to be trying to turn them into something they were never intended to be. Much more can and is said about Mora's then that, and it's almost universally positive. Their knives are definitely not disposable, unremarkable pieces of steel. Well thought out and executed tools is how most of them can be described. I say "most" because a few of the really inexpensive ones are probably throwaways, but those are the exception to the rule. I own the BB, Garberg and Kansbol, and among that group there's not a bad knife in the lot. In this case, inexpensive does not equal junk. Nobody said they were "junk," but you also said that you own a Clipper or two. They are among those at the lower-price position on the Mora 'totem pole' and are considered to be in that 'throwaway category' that I mentioned......most ly by the Scandinavians themselves! Moras have to be made from pretty good steel to stand up to the mundane chores that they are relegated to perform.....much like the replaceable blades for the Stanley utility knife that tradesmen & drywall installers in our country more commonly use. Nobody said they were "junk," but you also said that you own a Clipper or two. Pardon me....my mistake, that was pap11y in the OP that had the Clipper. We seem to be in agreement then.....Moras are not toys they are inexpensive tools. I agree, they're Cheap, ugly, disposable utility knives. Granted, their higher end models like the Garberb and the Eldris are hardy serviceable knives suited to the out of doors, but you can't get away from the ugly factor. Correct me if I'm wrong, but as I understand it the Garberg is Mora's flagship of the line and runs over $100.00 retail, there are allot of semi and custom made knives on the market that have exceptional quality in materials and workmanship, many made here in the USA by small independent shops that sell for that or not much more, and they are good looking besides. There are also many excellent outdoor knives on the market that are just as tough, sharp, useful as the Garberg for half or less the price of the Garberg, the Seal Pup for example, still an ugly field knife in my opinion, but better quality than the Mora and has built a solid reputation over the last decade, and can be had for under $40.00 at Walmart. Another under appreciated series of knives that I believe are allot better quality for often less money are Hultafors knives, they are also just as ugly as Mora's knives and also come on plastic sheaths, but I've had no problems with chipped and rolled edges with Hultafors that I've experienced in the past with Mora knives. 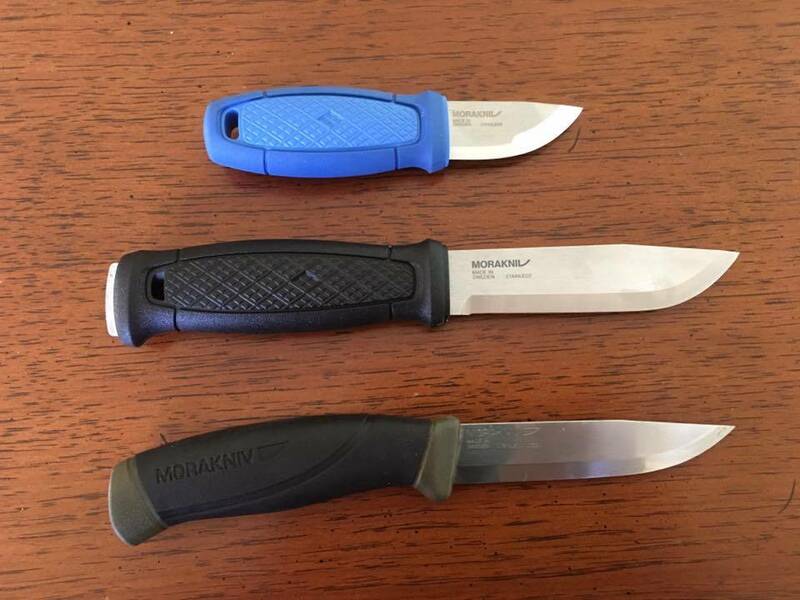 Personally, if I had to use a Mora Knife and had to choose the model I had to go with it would probably be the Clipper or the Bushcraft Black, both I think are more comfortable to use than the Garberg. That's not even a factor as beauty is in the eye of the beholder. I go for function over pretty anyway; with use all the fancy stuff wears away. Seems they're in the $90 range now. I got mine last October for $60 on Amazon, so not sure what happened there. Directly compared to the BB, I don't know that it's worth more than twice the money though (BB are under $40, which is a good bargin). The only Hultafors I have is the 380020. Sheath isn't as secure as the Mora's, but it's serviceable. Handle is where it falls short; it's thick enough to fill the hand well, but the plastic is a bit cheesy and a little too smooth so when your hands get sweaty you have to clamp down with some force to prevent torquing. A good point was made here. Beauty is in the eye of the beholder. We know certain folks here never miss a chance to make a disparaging comment about Mora knives and we all tolerate it. Our lack of response doesn't mean we agree or approve of it. I have never seen such consistently negative comments about anything else on this forum. 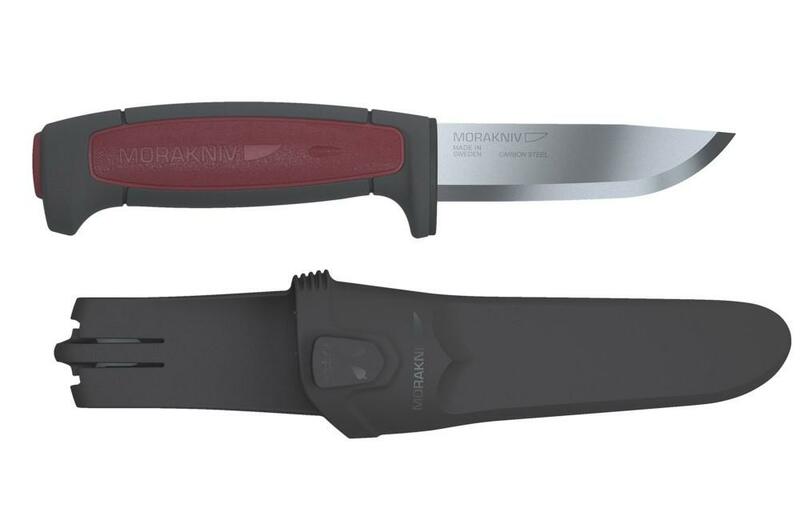 Something else to consider is that Morakniv is certified to ISO 9001-2008 Quality Management System. ISO does not write specifications on how to make a good knife. They make specifications on how to manage your business and the supporting technology to insure that you can repeatedly make a product of the quality you desire. One of the things that is very prominent is the requirement for documented procedures and calibration of instruments used to control the properties of the materials used. Think heat treatment. They must use only certified calibrated thermocouples, they must map their furnaces to ensure thermal uniformity, the display gages must be calibrated, all calibrations must be performed by a person or company who has qualified, trained personnel. The liquid in the quench tank must be constantly monitored for temperature, the quenching process must be capable of hardening through the material used, written procedures must be available to all operating personnel. It goes on and on and only the best companies get certified. While custom knife makers seem to enjoy great respect, only a few of them are ISO certified. It is a lot of work to maintain the records required for certification. But without some system to control things like temperature uniformity, how do you know your favorite custom knife maker can control the temperatures used to heat treat that super steel? It could be QC that the certain folks you mention are only pointing out that given the cost, looks, feel, and cheap accessories that Mora offers puts their knives into a much different category of knives when compared to other production and custom made knives especially made for the outdoorsman, even if they do cost more to purchase. Personally I have no gripe with Mora knives or the people who use them, in my opinion I doubt very much that one could find a better utility grade knife for the money than most of Mora's offerings, I also understand that for some folks the only thing that matters is function, if it's sharp and it cuts it's good enough, that I require more from my gear and have a certain appreciation for the artistry that went into creating a tool or piece of gear that not only functions great, but looks good doing it is purely a personal issue of mine. However what does get under my skin is that when the subject turns to cutting tools many Mora users put their Mora knives on a pedestal like they were the holy grail of bushcraft knives while the truth is they are cheaply made utility knives at best and not even close let alone equal in quality or appearance to the types of blades that Crash, Sarge, MLL, and other knife makers here are putting together, nor do they function as well, hold a edge as well, are as comfortable as, or instill any pride of ownership like a well made custom or higher end production knife, is and has been my only point right along. As far as Mora's certification, I thank you for the detailed explanation of the certification process, it tells me that Mora Knives is working very hard to maintain a consistent level of manufacturing quality to put out the very best cheaply made low cost production utility knives possible, and evidently they are successful at it. Nobody that I know here is intentionally putting down Mora knives just to be insulting, I think the aim is to put Mora knives in the right bin that they belong in. They make Chevys and they make Rolls Royces. Nobody confuses the two. Some people cannot afford to buy the Rolls and are just as well served by the Chevy for their purposes. Like I said, I have never seen anything so consistently maligned in this forum as the Mora Knife with nothing more than a personal opinion to justify it. So be it. You use your $300 hand made knife and many of the rest of us will get by just fine with a $20 Mora. QC that was an excellent post about the technical process. Thanks for posting that comment. I have custom knives, high end production knives and Moras and Opinels. 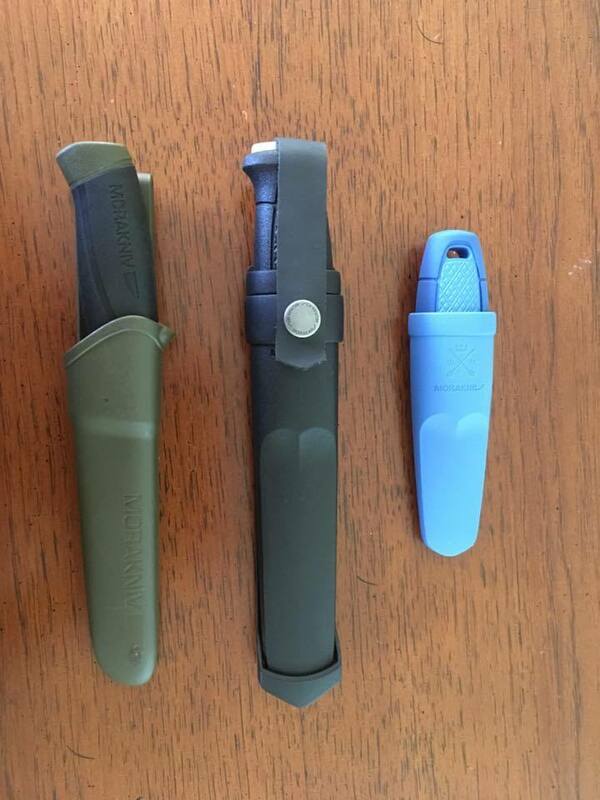 I use most of them over the course of my working and hunting/fishing activities and have come to the conclusion that there is very little difference in their function. A sharp edge is a sharp edge. Blade shape and thickness can make one knife a better skinner or slicer but all of them will perform those tasks to one degree or another. A Chevy goes down the same road the Ferrari travels. One is just a little more fun. They make Chevys and they make Rolls Royces. Nobody confuses the two. Some people cannot afford to buy the Rolls and are just as well served by the Chevy for their purposes. I don't understand the problem here. Is there a problem that I'm not seeing? I never really saw anyone making any "disparaging" comments about Mora knives in any of the posts in this thread, but I suppose I could have missed something along the way or just read it differently.
" I agree, they're Cheap, ugly, disposable utility knives." Kinda strikes me as being desparaging. Someone spent their time and money to post an evaluation of equipment they feel will serve them well and this comment is just a slap in the face. If you did not notice, the prices were in Australian dollars so I am guessing the man making the post is Australian. This thread prompted me to get out my favorite Mora and look it over. Mine is exactly like one of those in the OP's photo, I think it is being referred to as the clipper. It is very light, the sheath retains the knife better than most, and it is easy to sharpen. It works well preparing food especially when slicing things. I dressed out a doe deer with it last year in muzzleloader season. I recall it was good at opening up the cavity and really good at removing the backstrap and tenderloins. When it gets bloody when you are cutting loose the parts that are fastened to the carcass the handle is still easy to grip. Far easier than any other knife I own in fact. There is a Bark River Fox River with the micarta handle in my gear bag that is like trying to hang on to a bar of soap in the bathtub when you are gutting a deer. It is prettier than the Mora but doesn't work as well. Mora knives are just good fundamental tools to me. Inexpensive, sharper than many, and one doesn't gnash their teeth and wail if one is lost in the woods and cannot be found.
" I agree, they're Cheap, ugly, disposable utility knives." Kinda strikes me as being desparaging. OK........maybe one. 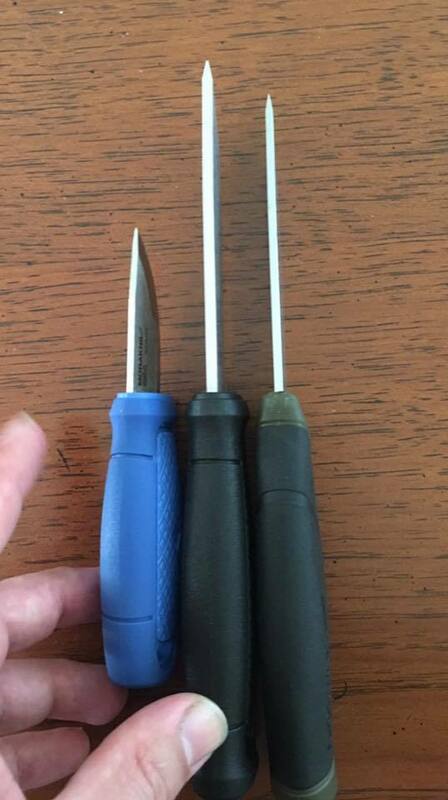 BTW....I just purchased another Mora last week on eBay that is slightly smaller than the Clipper or Companion. It's even less expensive and feels good in the hand to me. It's going in the saddlebag of the motorcycle for when I need a cheap, expendable utility knife. EDIT: I don't think it's ugly.....after all, beauty is in the eye of the beholder. I like that one. Looks like a smaller version on the one I have........ sort of. With the advancement of metallurgy great knives can be had cheap. My opinel has stood up to work abuse going on three years now and other than blade wear is the same knife as the day I paid fifteen dollars for it. My next fixed blade is going to be a cheap mora, if I like it I will make a leather sheath, hate the plastic one. Each of us has our own poison, some like expensive well made custom knives. One weakness of mine is ridiculously expensive work boots, I don't own a pair that cost less than two hundred dollars; my work socks have to be merino wool, I will not wear any other. No, they're right Wolfy, I guess it's time for a little Apologizing, my personal bias and some good natured banter got away from me, in my circle of friends being contrary is the norm and expected, but it's never intended to be mean spirited, sometimes I forget my place and opine when I should keep my trap shut. While I don't apologize for my opinion of todays Mora knives in the context of comparing them to some of todays more sophisticated outdoor fixed blades, I do recognize their worth as quality made utility type knives, and I should have been more sensitive to the author of the opening post as well as others here who don't share my views on rubber handled plastic sheathed knives. But it's not just Mora knives guys, I don't have much use for anything tagged "tactical", and you won't catch me wondering around the woods with any kind of gear or clothing that's spandex or brightly colored in pink, blue, red, purple, or neon zombie slime green, and as much as I like the Robertson clan, I'm not into the Camo look either unless I'm Turkey hunting. So there you have it boys, sorry if I offended anyone. OK, I'll accept that.......my guess is that you like Fur-Fish-Game magazine better than Gray's Sporting Journal, too. Well I didn't make the knives and am certainly not offended. And yes Quenchcrack is spot on. I'm in Australia and I did mention this when talking about prices..
yeah, that sounds tolerant. laughing. I consistently bash Mora knives because the constant gushing about how wonderful they are is as off putting to me as bashing them might be to someone else. Granted, they are decent blades. Granted that not everyone wants better. Granted that beauty is in the eye of the beholder. But also grant that they are decent, but not great. Grant that some folks DO want better, and have no issues with the cost of "better", and grant that beauty is in the eye of the beholder. So to speak. I don't understand why extoling the virtues of an expensive knife should be acceptable but similar praise for a less expensive knife is not acceptable. As has been said before, beauty is in the eye of the beholder. Buy what pleases you, post photos of your favorites. It is not that we do not recognize the differences between a Mora and a fine custom made knife. It is a difference in relative values. I do not need or want a $300 knife when a Mora will do what I need to do. Neither do I drive a McLaren, live in a McMansion, or own dozens of guns. Do what you want with your money, be pleased with what you buy. We will do the same. There is no cause to argue. Well put Mannlicher, It's exactly the way I feel about Mora knives, I don't hate Mora's, nor am I a fan, as utility knives go they are one of the best in my opinion, but if all I wanted was a cutting tool that performed OK and was inexpensive there are allot of knives on the market that I can choose from that are in the same price range, are just as functional as any of Mora's offerings, but that are much more pleasing to the eye. On the flip side of that same coin I can understand how some people view the pure utilitarianism of a Mora Clipper or Garberg as enough and that how they look is irrelevant, what I can't understand is the cult like following that they command. Like you point out, they are decent cutting tools, but far from great, they don't look so bad that they are revolting, but they aren't attractive in any way, true, most of my knives are customs, but it's not what they cost that makes them special, it's the time, effort, skill and craftsmanship, and the fit and finish of the materials that go into the finished knife that makes each one an individual and gives it warmth and soul that makes it stand out. I guess what it boils down to is perception, with me it's not just my knives, I feel the same way about all my toys and tools, whether it's my woodworking tools, bushcraft gear, or cutting tools, I buy the best I can afford, I treat them with respect, keep them clean and well maintained, and take a certain pride in ownership. I have a friend who can do just about everything well, he has a shop full of hand and power tools, welders and the like, but his tools are banged up and dirty, and he spends more time looking for his misplaced tools than he does working on his projects, I guess that's the difference between us, he doesn't have that same connection with his tools, as long as they work it's good enough for him.